As much as I love sweets and desserts, I’m a little sugar-ed out. Between Halloween and making Christmas cookies for upcoming posts, I feel like I’ve been eating way too many sweets the last few days. 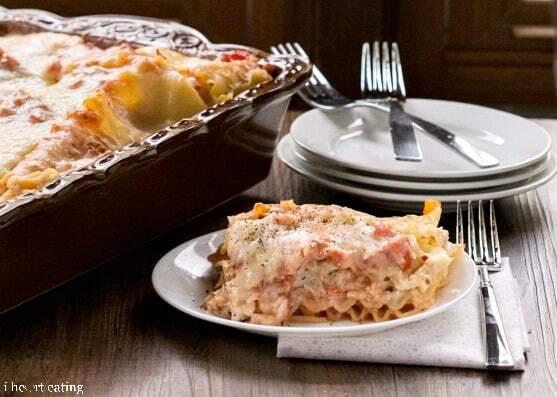 So, today is all about good ol’ comfort food – food like Creamy Tomato-Basil Chicken Lasagna. Now, we all love lasagna in our house. In fact, it’s my husband’s favorite food. 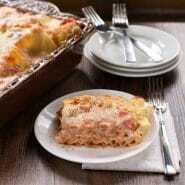 Since we have it fairly regularly, I try to come up with twists on classic lasagna. If you’ve ever had creamy tomato-basil soup, you know how well those flavors work together. There’s also a healthy amount of garlic in this lasagna, but it blends in nicely. 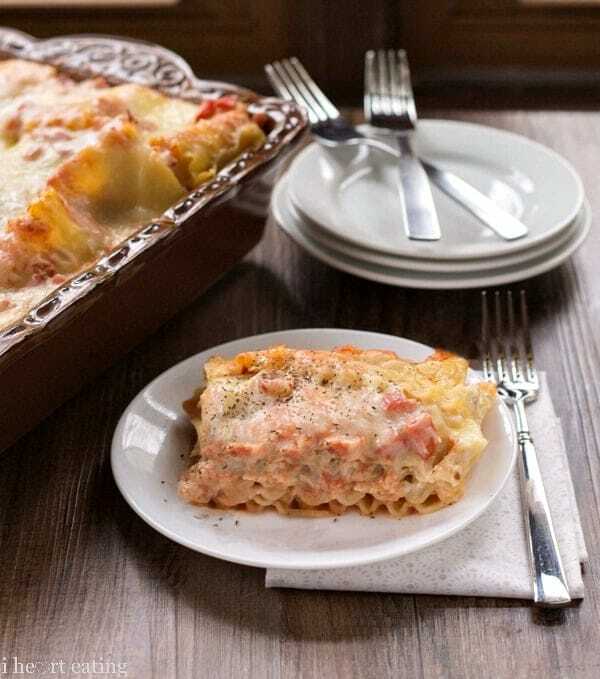 So, if you’re looking for an easy and delicious dinner, give this lasagna a try! Preheat 350 F. Lightly grease a deep 13x9-inch baking pan. Set aside. In a large bowl, stir together shredded chicken, ricotta, mozzarella, egg, basil, oregano, parsley, garlic powder, salt, and pepper. Set aside. To prepare the sauce, stir together crushed tomatoes, diced tomatoes, garlic, basil, sugar, baking soda, cream, salt, and pepper. To assemble, put a scant amount of sauce in the bottom of the baking pan. Layer in the following order: 4 lasagna noodles, one-third of the chicken filling mixture, about 1/2 cup of the tomato sauce, 1/3 cup Italian cheese blend. For the top layer, place 4 remaining noodles over cheese, and then pour remaining sauce over noodles. Sprinkle 1 cup remaining Italian cheese blend over sauce. Spray a piece of aluminum foil with nonstick cooking spray, and cover pan tightly with foil (greased side down). Bake for 45 minutes, or until hot and bubbly. Uncover, and cook for 5 additional minutes. Let the lasagna sit for 5-10 minutes before cutting and serving. This sounds delicious. Thanks for your recipe. This looks delicious, Kate! :) Thank you so much for sharing at Marvelous Mondays this week! This looks fab!! Pinning!! Can’t wait to try it. Oh my good heck!! This sounds better than fantastic! I have to make this. Pinning it right now. I am feeling the same way! I hate to have to admit that I’m way sugared out…maybe to a point. But, dishes like this is what I want to see! Then I guess we can talk dessert later! hehe! Loving the chicken in these meal. Pinning and sharing …bcz moms (and dads) out there need to have this on their menu list! Oh… the sauce for this sounds delicious. Totally need to give this one a try! I have been craving pasta lately and this sounds perfect! Now to muster up the energy to make lasagna, I’m so lazy! haha. :) Pinning, thanks Kate! I found you on Six Sisters Strut Your Stuff party. This lasagna looks amazing! I am adding this to my menu for this next week. Oh wow, this sounds so dang good. What is the secret with the baking soda in the sauce? Thanks!! Tomato sauces can be overly acidic sometimes. A pinch or two of baking soda helps to neutralize some of that acidity, and I think it also helps keep the sauce from curdling.